The ingredients for this week’s Freshlyblogged challenge were amarula, dark chocolate, almonds and pears! 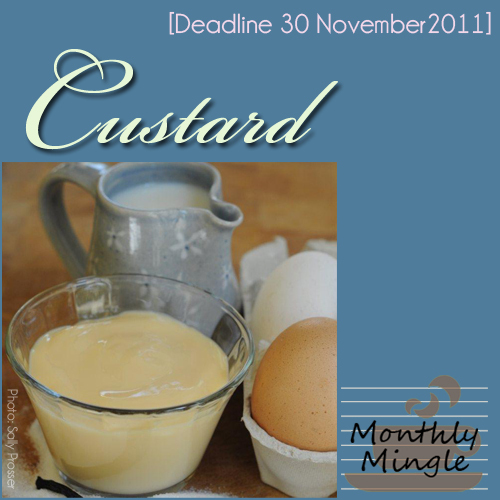 One of the rules was that our dish had to feature a custard based recipe. Initially I considered making an ice cream like this vanilla ice cream or this mango ice cream with pears instead of the mangoes. But it is winter and I am not fond of ice cream in winter. 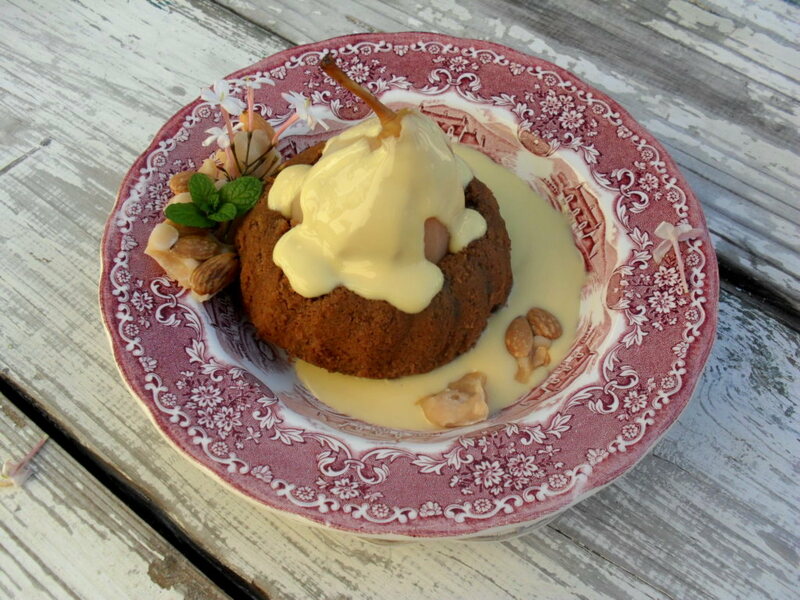 I considered so many ideas and in the end I decided to make a winter pudding combining the various ideas into one. This chocolate and amarula pudding with the poached pears are one of the best puddings that I have ever made. I served it with amarula custard and fudgy almonds. 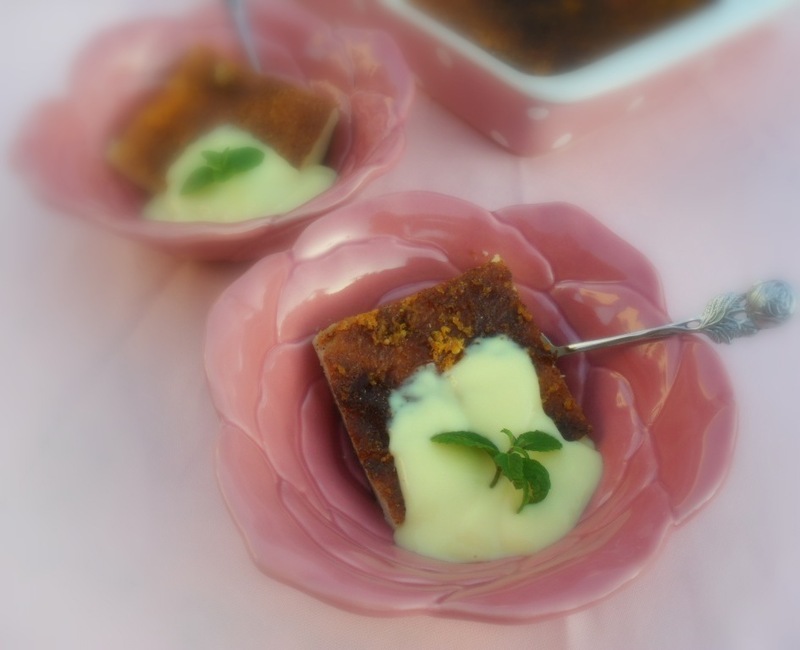 Everyone that tasted it fell in love and this will surely become one of the favourite puddings in my house that I will make again and again. Place almonds in a single layer on a baking sheet and roast for 8 to 10 minutes. Place the nuts on a tray lined with baking paper. Place the sugar and milk in a small saucepan and stir together. Cook over medium heat for approximately 8 minutes or until the mixture forms a soft ball when dripped onto a cold plate. Remove from the heat, add the amarula and mix through. Drizzle over the roasted nuts and leave to cool down. Peel the pears. Slice a piece from the bottom so that the pear will be able to stand. Place the water and sugar in a saucepan and bring to the boil. Stir until all the sugar has been dissolved. Add the pears and simmer on a very low heat for 30 minutes. Remove from the heat and allow the pears to cool down in the cooking liquid. Grease 4 small cake pans (10 to 12 cm diameter). Melt the butter, sugar and chocolate together in a double boiler or on low heat in the microwave. Stir until the chocolate mixture is smooth and let the mixture cool down. Add the eggs one at a time and beat well after adding each one. Sift the self raising flour and salt together and add to the chocolate mixture alternating with the milk. Mix together. Spoon into the prepared baking tins and bake in the pre-heated oven for 20 minutes or until baked through. Mix the poaching liquid and amarula together and pour over the cakes once removed from the oven. Cool down slightly before turning out onto serving dishes. Beat the egg yolks, sugar and salt together. Heat milk in a saucepan until it boils. Add hot milk to the egg mixture and mix well. Return to the saucepan and heat over very low heat, whilst stirring all the time. The mixture must never cook, so it is safer to do this in a double boiler or in a pot or bowl over cooking water. Cook until the mixture coats the back of a spoon. Remove from heat, cool down slightly. Add the amarula and mix well. Make a round into each pudding and place a poached pear in the middle. Drizzle with some custard and pieces of fudgy almond. Serve the dish lukewarm. I would like to thank everyone that voted for my recipes up to now; I really appreciate your support! Oh Zirkie this just sends me into ecstacy! 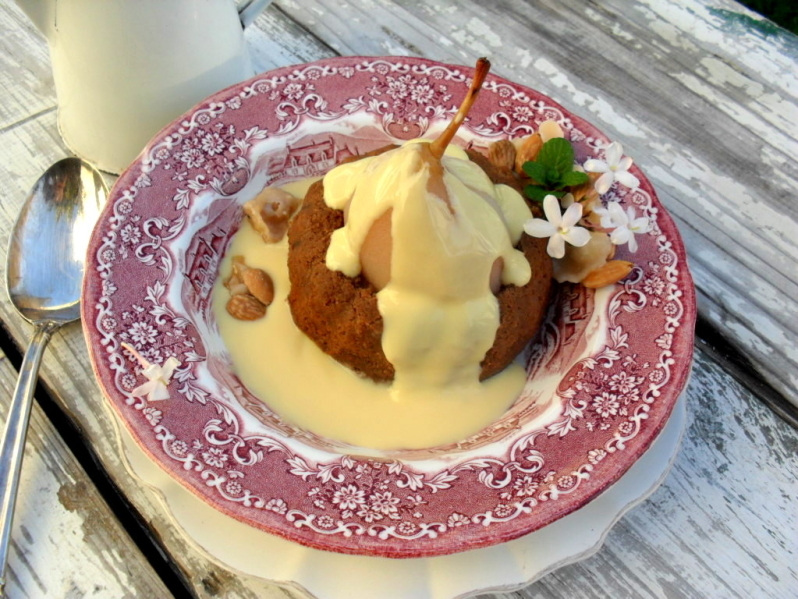 I love poached pears and amarula and custard and and and … absolutely yummy!